Hawaii Native Status: Introduced. This naturalized fruit tree and ornamental landscaping plant is native to Brazil. Description: The flowers have 4 or 5 white petals and numerous white stamens. The fruits are up to 1 1/2 inches (3.8 cm) in diameter and have red (sometimes yellow) skin, whitish flesh, and persistent calyx lobes. The leaves are glossy, leathery, dark green, hairless, and broadly to narrowly egg-shaped. The crushed leaves have a resinous odor. The bark is smooth and brown. 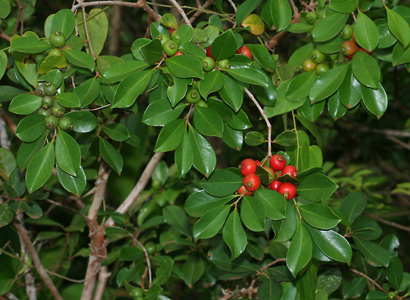 Here in Hawaii, Strawberry Guava is a seriously invasive weed in wet and mesic forests, open areas, and along roadsides from sea level to about 4000 feet (1219 m) in elevation. This plant suckers and can form vast, dense thickets that crowd out native plants. Non-native birds and Feral Pigs (Sus scrofa) love the fruit and are responsible for spreading the seeds. 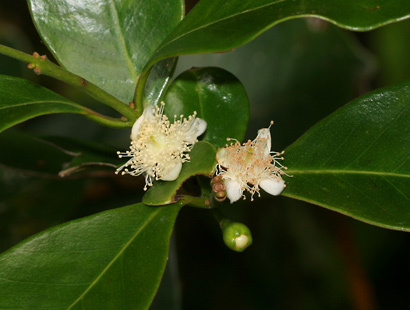 The other Guava species found in Hawaii, Guava (Psidium guajava), has prominently veined leaves and larger, musky-fragrant, yellow fruit. Edible – The fruits are edible and can be used fresh, cooked, or preserved. Both the strawberry-flavored skin and the sweet, juicy pulp are eaten. 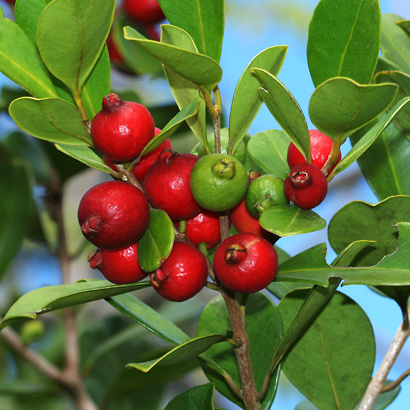 Strawberry Guava fruit does not have a strong, musky fragrance like that of Guava (P. guajava) and is not as flavorful.